Here is a series on good male bashing jokes… no prizes for guessing that they were invented by a guy to please his wife! lead. Walk beside me and be my friend. were and ask why not. to love someone -but it takes a lifetime to forget someone. could be. It was a fantasy, a dream come true. It was the day I met you. the more you forget, the less you know so why study. doesnt, it was never meant to be. cried for you. Some day you will want me, and I won't want you! you do. I'm sorry I just can't help myself. I fell in love with you. doesn't mean I won't disappear. being a damn fool about it. when you criticize them, you're a mile away and you have their shoes. that's what I'll do. You don't know what you do to me. You don't have a clue. You don't know what it's like to be me looking at you. Isn't it funny how the mood can be ruined by just one busted condom? to waking up in the morning, but they don't feel the same about you? Hard work pays off later. Laziness pays off now. turned off the bed and jumped into light, all because you kissed me goodnight. got hit by a bus. Real men date cross country runners. Catch us if you can. going to die, then you know you are ready to start the second mile. God made cross country runners. The Devil made the course. Worry is a payment for a debt that you may never owe. Cross Country was invented to make water taste good. I'm sorry I offended you; I should have lied. learn to live in the same box. but smile when you see one tumble down the stairs. hours. I don't even want to do anything that feels GOOD for 36 hours! You ask me why I run? It's the same reason I breathe, because I have to. that looking back on the laughs would make me cry. Sometimes you're at your best when you feel the worst. ("Nice Guys Finish Last"
It's not the men in your life that count, it's the life in your men. wouldn't seem quite so funny. Girls don't lie. They simply bend they truth to fit their mood. be broken but circles are neverending. it. It really is worth fighting for, being brave for, risking everything for. And the trouble is, if you don't risk everything, you risk even more. Why do we say love hurts? It's the absence of love that hurts. watching him, not watching me. Moment to moment, there are aspects of life that we like, and others we don't. of life, you'll spend most of your life fighting battles. myself to stop loving you. It's not telling you how I feel that scares me; it's what you'll say back. I've given up looking for the meaning of life...all I want now is a cookie. of gold, but so does a hard-boiled egg. It's not having what you want; it's wanting what you've got. ("Soak up the Sun"
round from cloud to cloud, I got the feeling like I'm never going to come down. Never give up on something you can't go a day not thinking about. and it is ok to say hello to someone you don't know. That is Philadelphia. All I'm saying is that somewhere out there is the man you are supposed to marry. when we don't know what to do. sitting next to you saying "Damn...that was fun"! I found a reason for me to change who I used to be, a reason to start over new. We were 18 and it felt so right...sleeping all day, staying up all night! Shampoo is better. I go on first and clean the hair. No, conditioner is better. It's not always rainbows and butterflies; it's compromise that moves us along. have four years to be irresponsible here. Relax. Work is for people with jobs. turns on you with a miniature machine gun. your heart to things you don't want to feel. shower, but when I get out, I am going to pee, shave, and then iron my pants. up lookin at away messages". Funny how that guy never seems to go idle. hoping that she still finds happiness, even if it's never going to be with you. light in the heavens, fleeting glimpse of eternity, and in a flash they're gone. without makeup on. The one who turns to his friends and says, "thats her". I'm going to punch you in the ovary, a straight shot right to the babymaker. please, cause we belong together. Who am I gonna lean on when times get rough? I kind of believe in fate. It just works in really fucked up ways sometimes. If you've never stared off into the distance then your life is a shame. ("Mrs.
What made you feel that stomach-churning agony for one person and not another? It was a feeling I'd never known...for the first time I didn't feel alone. you do. Oh we just get closer. I fall in love all over everytime I look at you. Being perfect is not about that scoreboard out there. It's not about winning. fall deeply in love - well, you haven't lived a life at all. You have to try. Because if you haven't tried, you haven't lived. it's like to be whole. AND IF NOT, THEN YOU MIGHT WANT TO DOUBLE-CHECK YOUR PULSE.. I was privileged to take a photo of "Five Generations of Women" shortly before my 93 year-old Grandmother passed away last year. 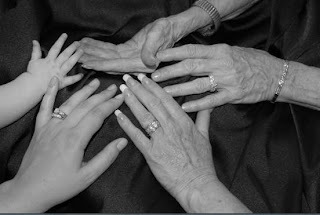 The photo, shown below, features the hands of my Grandmother, Mom, Sister, Niece and Great-Niece. While I can't take credit for the idea, I was so happy to have had the suggestion & capture this moment. It inspired a friend of mine to do something similar, which turned out so beautiful it became a special keepsake, prior to her father's passing. GRANDMA'S HANDS A must read thru to the end please!! Finally, not really wanting to disturb her but wanting to check on her at the same time, I asked her if she was OK. She raised her head and looked at me and smiled. "Yes, I'm fine, thank you for asking," she said in a clear voice strong. I slowly opened my hands and stared down at them. I turned them over, palms up and then palms down No, I guess I had never really looked at my hands as I tried to figure out the point she was making. "Stop and think for a moment about the hands you have, how they have served you well throughout your years. These hands, though wrinkled shriveled and weak have been the tools I have used all my life to reach out and grab and embrace life. They put food in my mouth and clothes on my back. As a child, my mother taught me to fold them in prayer. They tied my shoes and pulled on my boots. They held my husband and wiped my tears when he went off to war..
"They have been dirty, scraped and raw , swollen and bent.. They were uneasy and clumsy when I tried to hold my newborn son. Decorated with my wedding band they showed the world that I was married and loved someone special. "They have held my children and grandchildren, consoled neighbors, and shook in fists of anger when I didn't understand. "These hands are the mark of where I've been and the ruggedness of life. But more importantly it will be these hands that God will reach out and take when he leads me home. And with my hands He will lift me to His side and there I will use these hands to touch the face of Christ." Greg Thomas, a Glamorgan fast bowler, thundered in and beat Vivian Richards's bat. "It's red and it's round. Can't you see it?" the bowler taunted. The next ball was precisely the same; pitching three quarters of length on middle and off, seaming away, and once again Richards was comprehensively beaten. "It's red and it's round and it weighs four-and-a-half ounces. Can't you see it? ", Greg Thomas quipped. The next delivery was right in the slot, and Viv smashed the ball out of the ground and straight into the river that flowed around it. The batsman then said to the bowler: "You know what it looks like... now you go ******* get it!" Glenn McGrath to Zimbabwean Eddo Brandes after Brandes had played and missed at a McGrath delivery: "Oi, Brandes, why are you so ing fat?" 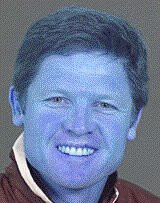 to which Brandes replied: "Cos every time I your wife she gives me a biscuit!" Apparently even the Australian slips were in hysterics. "i dunno ask your wife"
1993 - The Australian slip cordon allegedly greeted New Zealand batsman Chris Cairns with a chant of "Choo Choo" after his sister had just been killed in a train accident. down.We'll get him stumped." The Aussies and Cronje were all in hysterics. Brandes): "Hey Eddo, why are you so F**ing Fat?" ing bat & you can't ing bowl." he announced to the batsman: "In my culture we just say *ff." don't get a runner for being an overweight, unfit, fat c**t!!!" 9. McGrath to Ramnaresh Sarwan: "So what does BrianLara's taste like?" Sarwan: "I don't know. Ask your wife." rip your F*fing throat out." "Put a kebab on a good length. That should do it." going to have to bowl around the wicket and kill you?" should've kept my legs together, Fred". "So should your mother" he replied. At the end of steve waughs career he had just come out to bat and a young keeper was giving him some crap so he turns around and says " have some respect son when i played my first test you were still in your diapers"
Wiki refers to sledging as 'exchanging words with opposition player(s) which can put him(them) off their usual game; it is an attempt to "psych out" an opponent'. Cricket is a very interesting game, and sledging adds to it the extra spice that make it much more than just game. The year was 1989, the little master had recently made his debut in Pakistan. Sachin not even old enough to get a driving licence Sachin Tendulkar was facing the best bowlers in the business. As the Pakistani crows jeered and mocked Sachin holding out the placards saying "" Dudh Pita Bhachcha ..ghar jaake dhoodh pee", (hey kid, go home and drink milk), Sachin sent the then young leg spinner Mustaq Ahmed hiding for cover (he had hit two sixes in one over. The frustaded mentor of Mustaq Ahmed the legendary Abdul Qadir challenges Sachin saying " Bachchon ko kyon mar rahe ho? Hamein bhi maar dikhao` (`Why are you hitting kids? Try and hit me.`). Sachin was silent, since then we all have come to know that he lets his bat do the talking. Abdul Quadir had made a simple request and Sachin obliged, and how. 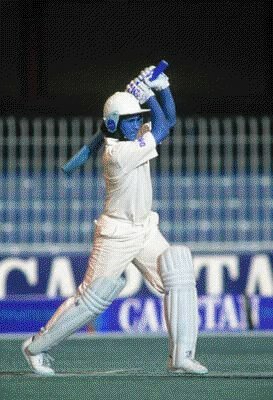 Sachin hit 4 sixes in the over, making the spinner look the kid in the contest. The over read 6, 0, 4, 6 6 6, David had felled Goliath ... and a legend was born. Chasing India's score of 287-8, pakistan got off to a flyer of a start, Amir Sohail and Saeed Anwar went about tearing the Indian bowling attack. Pakistan looked all set to win as they reached 110 odd for the loss of just 1 wicket within the 15 overs. 1. Play a Great Shot: Amir Sohail was completely bent on demolishing the Indian bowling to pieces, charging down the track to the faster bowlers (if u can call Prasad that) in this particular case he came down the ground (a good 4-5 steps, anymore and he would have hit Prasad too) and slashed the bowl over vacant off side area... the ball disappeared into the fence in a flash ... what followed has since been etched in the memories of every cricket fan in the subcontinent. The comeback was truly remarkable, almost a miracle .... Prasad has bowled thousands of deliveries and taken hundereds of wickets in his career but, it was this one granted him a place in the History of Indian Cricket .. for ever... the ghost of Miandad's last ball six was exorcised, once and for all. Ambrose replied, "Don't cuss me, man", before Waugh's response, which had nothing to do with bowling. "Unfortunately, nothing inventive or witty came to mind, rather another piece of personal abuse: 'Why don't you go and get f*cked.' "
Aussie paceman Glenn McGrath was bowling to Zimbabwe number 11 Eddo Brandes - who was unable to get his bat anywhere near the ball. McGrath, frustrated that Brandes was still at the crease, wandered up during one particular over and inquired: " Why are you so fat?" Glamorgan quickie Greg Thomas had beaten Viv Richards' bat a couple of times and informed the legendary West Indian ace: " It's red, round and weighs about five ounces, in case you were wondering." The very next ball was given the King Viv treament and smashed out of the ground, into a river - at which point Richards piped up: " Greg, you know what it looks like. Now go and find it." Merv Hughes usually never short of a word while on the field, rarely keeps quite. During a test match in the West Indies Hughes didn't say a word to Viv, but continued to stare at him after deliveries. " This is my island, my culture. Don't you be staring at me. In my culture we just bowl." Merv didn't reply, but after he dismissed him he announced to the batsman: " In my culture we just say f*ck off. " Mark Waugh- " Ohh, I remember you from a couple years ago in Australia. You were sh*t then, you're fu*king useless now". Parore- (Turning around) "Yeah, that's me & when I was there you were going out with that old, ugly sl*t & now I hear you've married her. You dumb c*nt ". Its common knowledge that Indian's usually don't resort to sledging, and the Aussies swear by it. In this rare ocassion the tables had turned and it was the Aussies who were at the receiving end. 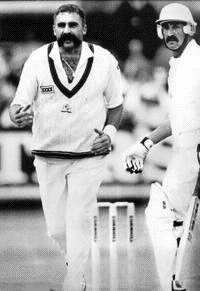 Whitney: "If you leave the crease i'll break your f***ing head"
Shastri didn't bat an eyelid before replying : " If you could bat as well as you can talk you wouldn't be the f***ing 12th man "
Miandad played Lillee to s quare leg and completed an easy run, with a collision taking place in the center. According to Miandad, Lillee had tried to block him in the path. After a verbal exchange, Lillee went ahead and kicked Miandad on his pads. Miandad, started charging towards Lillee with his bat lifted high above the head, as if to hit him. The umpire's intervention prevented what could have turned out to be a real assault had Miandad gone head with his plans. 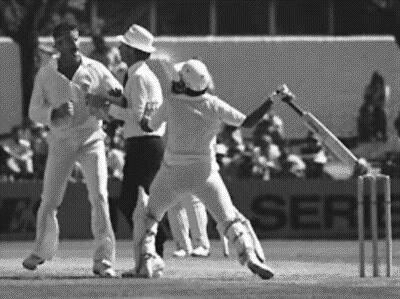 However, the picture of Miandad hurling his bat at Lillee made the whole incident look even worse, and was promptly declared as the most indignified incident in the history of Cricket. Lillee's version, to this day, had Miandad first hitting him with the bat, and then swearing at him. He maintained that there was no contact from his side throughout the incident. The Frog Jumping incident, 1992 India Vs Pakistan: India vs Pakistan matches are always a treat to watch, and if its the World Cup its stakes are even greater. Javed Miandad, the Bad boy of cricket, at the receiving end for once. Miffed by the verbals from Kiran More, he complains " Insaan khel rahe hain janwaar nahin" (Human beings are playing not animals). And after a sharp run out chance, where Miandad closely survives Miandad starts jumping up and down, face distorted imitating Kiran More's appealing. A sight to behold. Pure comedy. Pakistan loses the match but go on to win the cup. 'I did it instinctively', Miandad later told. He added, 'Hey, is this the way you appeal for everything? Don't appeal like that '. You can also watch the video of the incident. Waugh has however denied that quote, instead claiming that he said " looks like you've dropped the match". fast bowler Dennis Lillee, who Gavaskar claims abused him after claiming his wicket and the Indian captain asked non-striker Chetan Chauhan to walk off the field, forfeiting the match. Gavaskar was batting on 70 when Lillee appealed for a leg before decision. 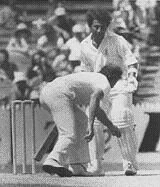 Gavaskar showed his bat to the umpire, indicating he had 'nicked' the ball before it hit his pads. Angry words were exchanged between the batsman and the bowler, and Lillee even went to the extent of pointing to the batsman the spot where the ball had his pads. The decision went in favour of the bowler and as Gavaskar started his long, dejected walk back to the pavilion, Lillee turned around and abused him. That was it. Gavaskar snapped, and decided to forfeit the match. Later, Gavaskar was to write in his book 'Idols': "That (the walkout) was the most regrettable incidents of my life. Whatever may be the provocation and whatever the reason, there was no justification for my action and I realize now that I did not behave the way a captain and sportsman should ." Waugh replied: 'Look, show a bit of respect. You were in nappies when I debuted 18 years ago' . England's "Barmy Army" recently decided to sledge leg spinner Shane Warne musically, and it has been described as boorishly personal, but effective. This is an excerpt from a very good dietician who himself consumes alcohol but follows these steps to make sure he remains lean. And Raghu and Rajat, please be assured that consuming alcohol is the next best way to add calories after having fat rich food. So read on. Of course, if you have no problem abstaining from alcohol, then that will certainly be the best thing for your health and your body. However, for the rest of us, that actually do like to partake in some social drinking, here are a few tips that have helped me to stay single-digit body fat lean, while still drinking occasionally. 1. Obviously alcohol gives you extra empty calories on the days that you choose to drink. Alcohol has 7 calories per gram, compared to 4 calories per gram for carbs and protein, and 9 calories per gram for fats. On nights that I know are going to involve some drinking, it helps to make sure that dinner is based only around protein and vegetables. You're going to take in a lot of empty calories with the alcohol, so eating a good portion of appetite-satisfying protein along with nutrient-rich vegetables can help to control your appetite and give your body the nutrients it needs. Plus, most importantly, there's just no room for loads of carbohydrate-rich foods if you're also going to be consuming alcohol. Carbs + alcohol is a perfect recipe for growing a beer belly! 2. If you want to save your body from adding layers of ugly fat, by all means stay away from syrupy, fruity drinks that are loaded with sugar... this is a double whammy for your gut as you're not only getting all of the empty alcohol calories, but also loads of empty sugar calories. Big fruity drinks such as a margarita can sometimes have as much as 500-600 calories per serving! Instead, your best bet is to stick with a clear alcohol mixed with club soda and a squeeze of lime or lemon. Vodka with club soda and extra lemon/lime squeeze is my drink of choice at the bars/nightclubs. Stay away from tonic water mixers! Some people don't realize this, but tonic water is loaded with almost as much sugar as regular soda pop... on the other hand, club soda has no calories at all. It's clearly the lowest calorie way to drink. Also, trying to get in some sort of exercise the morning after your night out can also help to get your body back to a good state of health. This may not be your best workouts in terms of energy, but it can help to just get your body moving and break a sweat. 5. Avoid the late-night munchies after a night of drinking! This is where most people do the biggest damage to their waistlines. Instead, make sure to have some lean protein and vegetables quickly available at home (perhaps some pre-cooked chicken breasts, grass-fed steaks, or even tuna fish and some veggie sticks) so that you can satisfy your late night post-party appetite with lean protein instead of carbohydrates. The worst thing for your body is loading up on pizza, ice cream, and other carb-rich junk after a night out of drinking. 7. Wine is one of the healthier drink choices... if you must have a drink, you might as well choose wine so you at least get a good dose of antioxidants as well. Red wine is known for it's antioxidant content, however even white wines contain antioxidants as well. And finally, like I mentioned before, drinking alcohol just adds one more thing to your list that you have to work against in getting the body you want. Abstaining may always be the best choice, BUT we also need to be realistic and know that social drinking is not something that most people are willing to give up entirely. For that reason, this list of tips to help manage social drinking in a healthier way can really help you to stay leaner and healthier and still balance a little bit of social drinking into your life.